Clublaptop Bow MacBook Mac Sticker Skin Decal Vinyl - Clublaptop - The largest online store by Manufacturer of Laptop Accessories and Spares. 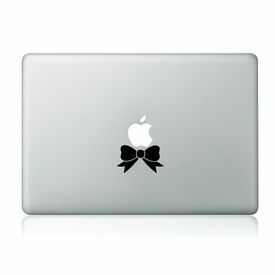 Clublaptop Bow MacBook Mac Sticker Skin Decal Vinyl for 11.6" 13" 15" 17"
Please Note: This is a MacBook Sticker & it doesn't cover entire LCD panel like Laptop Skin. Its not a laptop skin. Clublaptop brings Premium Quality Vinyl MacBook Stickers for Apple MacBooks. Design your Apple MacBook to flaunt your attitude & style. Have multiple stickers installed to give your Apple MacBook a brand new look. 1. Does CL MacBook Stickers fit for all types of MacBook Air and MacBook Pro? A. Yes, because the Apple logo has the same size on all MacBooks, including MacBook Air 11" and 13" and MacBook Pro 13",15" and 17" as well as the old white MacBook models. 2. Is it difficult to line the sticker up with the Apple logo? A. No, The stickers are delivered on transparent transfer film which makes the correct placement on the Apple logo super easy. 3. Can I remove CL MacBook stickers without leaving any marks on my MacBook? A. Absolutely, CL MacBook Stickers are made from high quality vinyl, the adhesive is water based, so they come off without leaving any traces. 4. Does all the stickers come in single piece? A. Depending on the designs, some MacBook Stickers may come in multiple pieces. For more information on product Call us at 09331393940 or mail us at shop@clublaptop.com. Clublaptop MacBook Mac Sticker Skin Decal Vinyl For Apple MacBooks Please Note: This is a MacBook Sticker & it doesn't cover entire LCD panel like Laptop Skin. Its not a laptop skin. Clublaptop brings Premium Quality Vinyl MacBook Stickers for Apple MacBooks. Design your Apple MacBook to flaunt your attitude & style. Have multiple stickers installed to give your Apple MacBook a brand new look. FAQ's: 1. Does CL MacBook Stickers fit for all types of MacBook Air and MacBook Pro? A. Yes, because the Apple logo has the same size on all MacBooks, including MacBook Air 11" and 13" and MacBook Pro 13",15" and 17" as well as the old white MacBook models. 2. Is it difficult to line the sticker up with the Apple logo? A. No, The stickers are delivered on transparent transfer film which makes the correct placement on the Apple logo super easy. 3. Can I remove CL MacBook stickers without leaving any marks on my MacBook? A. Absolutely, CL MacBook Stickers are made from high quality vinyl, the adhesive is water based, so they come off without leaving any traces. 4. Does all the stickers come in single piece? A. Depending on the designs, some MacBook Stickers may come in multiple pieces. CL Macbook Sticker Features Professionally designed Precise Cutting Ultrastrong & High Quality Vinyl Easy to install and peel off Leaves no residue when removed Over 300 Designs ***All brand names and images are the properties of their respective owners & are used here for descriptive purpose only. *** For more information on product Call us at 09331393940 or mail us at shop@clublaptop.com.